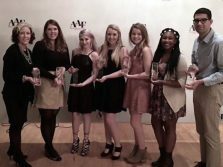 Photo: (From left) Joyce Haley, Cleo Sansing, Holli Heath, Kinsey Lee, Rachel Mallary, Erika Thrasher, and Hayden Walker are shown with trophies won by ACU at the American Advertising Awards ceremony. Students from ACU’s Department of Journalism and Mass Communication won several awards at the American Advertising Awards ceremony, hosted by the Abilene chapter of the American Advertising Federation. Student advertising/PR agency Morris + Mitchell and multimedia production agency 99 West won Gold and Silver awards for their work in the professional category. Although these organizations are student-run, they operate as professional agencies. The Gold winners will advance to the AAF District 10 competition, which encompasses a four-state area.